A detour on a family vacation sparked Duncan McClellan’s passion for glassblowing. One of the places they stopped during the 17-hour drive from Orlando to New York was the Blenko Glass Company in Milton, West Virginia. The visit immediately captivated the young McClellan and ignited his interest in glassblowing. “I hid for three hours to watch them blowing glass,” he said. Upon his return to Florida, where opportunities to learn about the art were nonexistent at the time, he sought out other creative pursuits. In his teens and twenties, McClellan worked in pottery and leather arts. But in 1987, the glassblowing flame was rekindled when he had the chance to try glassblowing at a studio in Ybor City. He then continued his education at the New York Experimental Glass Workshop and was the second American to work and study at the Ars Murano Artistic Glass Factory in Murano, Italy. Inspired by the colors of the sunset, McClellan spins, twists and inflates molten blobs into beautiful forms and vessels, to which he then adds imagery. McClellan is inspired by everyday conversations, experiences and nature, but he wants his viewers to take away their own ideas and messages from his pieces. McClellan said he has about 20 different forms that he works with, but he is always considering how he will fit the imagery onto the vessel. In late 2010, McClellan opened the Duncan McClellan Gallery in St. Petersburg. 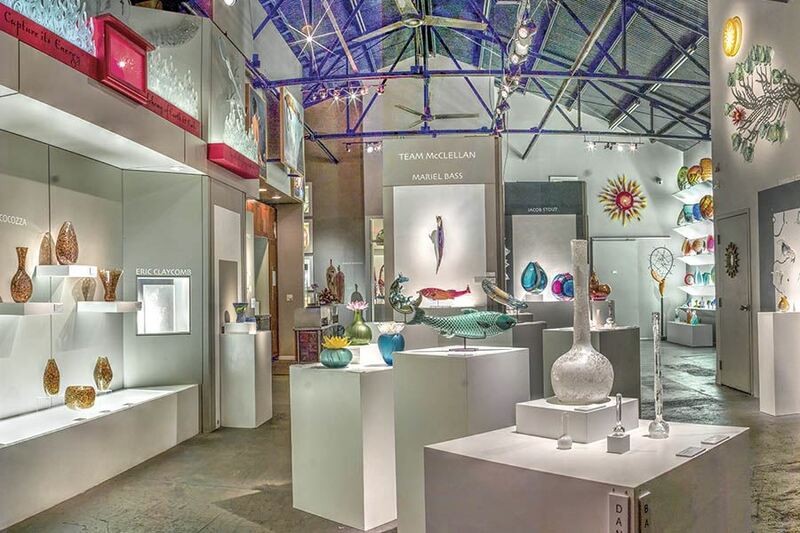 The gallery features nationally and internationally recognized glass artists and has meeting, lecture and demonstration spaces. In 2013, McClellan started the DMG School Project, which has demonstrated glassblowing to more than 10,000 visitors, initiated classes for Eckerd College students, hosted school groups for tours, provided lesson plans and fostered a mobile glassblowing unit that visits inner city schools. Thanks to McClellan, no other child interested in the art of glassblowing will have to wait 20 years before pursuing his or her passion. Painting by Jim Woodfield of Woodfield Fine Art Gallery. Local artists and a curator talk about the monthly event, how it’s evolved and what they’d like to see in the future. Once a month, thousands flock to St. Petersburg — and it’s not for a Rays game or a beer or concert festival. On the second Saturday of each month, the St. Petersburg Second Saturday ArtWalk draws young adults, families, seniors and everyone in between to around 50 galleries and art venues that remain open after hours. The city’s Second Saturday ArtWalk has become a tradition that attracts both locals and tourists to the city’s downtown and its surrounding neighborhoods. The ritual started small sometime around the late 1980s, when it included the area’s museums and a handful of galleries along the Central Arts District, but it has since expanded to include the 600 Block, the neighboring Warehouse Arts District immediately south of downtown plus the Edge and Grand Central districts on the outskirts of downtown St. Petersburg. Each ArtWalk attracts a steady stream of tourists and locals to opening receptions, which feature ever-revolving exhibits of new works with complimentary wine and cheese. For those intimidated by the idea of walking into a gallery, the event breaks down those self-imposed barriers between non-artists and the art world. The public strolls in and out of art spaces where they may quietly ponder a watercolor of a pastoral scene or provocative sculpture or experience for the first time a glass-blowing demonstration at Duncan McClellan Glass, a venue that’s become an anchor in the ArtWalk experience. Other standbys include the Morean Arts Center for early evening member shows and the Bloom Art Center for late-night mural and studio work art parties. “ArtWalk galleries and studios record between 3,000 and 4,000 visits,” says John Collins, director of the St. Petersburg Arts Alliance, the umbrella organization that coordinates the monthly event and provides maps and free trolleys. Artists participating in the event are usually happy to put in the time and put up with the lookie-loos to keep the ArtWalk going. “The ArtWalk is a way of helping the artists to be noticed and thus creating purchasing potential too, which creates a magnet for artists to come and work in the area, ” says artist Jenny Bleackley. 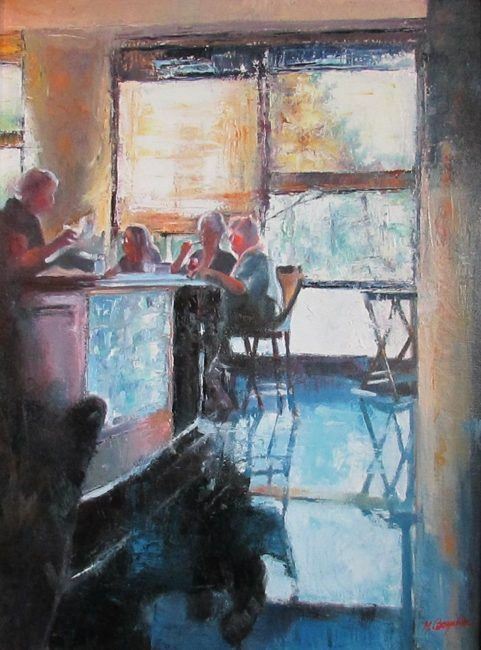 Incidentally, six paintings of Bleackley’s will be shown at Graphi-Ko Gallery on Central Avenue at this Saturday’s ArtWalk from 4 to 9 p.m. and will be up for a month. The works are part of her water series, Cool, Calm and Collected. The ArtWalk is not just a boon for artists and collectors but ingeniously serves as a jump-off point to nightlife outings. It’s a reason for many to dress up and feel like they’re experiencing a night on the town, even if their budget is tight and they can only afford a $25 photographic print to take home. With that, they’ve had a night out, most likely cavorted with friends or met some new people, learned about new artists and even purchased original art. Artist Nathan Beard has worked his share of shows during the ArtWalk and has noticed people even drive from outside the Tampa Bay area for the monthly event. According to Beard, the event has become an institution and, surprisingly, is still unknown to many. A stroll along St. Pete’s Central Avenue on the second Saturday of the month belies any notion that there are Tampa Bay citizens out there who still haven’t heard of the ArtWalk. “My last ArtWalk experience was last month, and included live painting and a pop-up art show/sales event,” says artist Jennifer Kosharek, who cheerfully adds that she met a lot of people that night and did well with her art sales. Michele Tuegel, the executive director of Florida Craftsmen from 1986 to 2004, curated works during the early years of the event in the late 1980s, when only four or five galleries participated a month. Tuegel, who ran a gallery at 320 Central Avenue up until last year has seen the entire trajectory from then to now. Her thoughts: The public and tourists love it. They want a unique, new experience, like the paper maps and “free” is important, but, for the most part, many still don’t understand how the free trolley service works. Besides staying open later and attracting younger participants, Spencer says there are other ways to bring more prominence to the event, to elevate it from a breezy central Florida pastime to an event that carries with it an imprimatur in the national and international art world. "Development is flourishing all over the Tampa Bay area. Here are some of the most-anticipated projects that are scheduled for major work and even completion in the Tampa Bay area in the coming year." The ArtsXchange is listed as number 10 - Click here to read about the other 11 who made the list! The work of Cuban artist Michel Mirabal emerged as a symbol of renewed relations between his nation and the United States when one of Mirabal's paintings served as backdrop for a historic news conference by President Barack Obama at the U.S. Embassy in Havana. Now, St. Petersburg is sharing in the symbolism. Mirabal has contributed the latest in a growing tapestry of murals around the St. Petersburg Warehouse Arts District — a work featuring U.S. and Cuban flags adorned with flowers and barbed wire colliding in an explosion of colors. He painted the work last week on an exterior wall of Soft Water Studios. "The barbed wire is the thing we don't like, the things we need to change about both countries," Mirabal said. "The flowers are the things we love — the humanity, the coming together." The artist lives and works in Havana and felt right at home during his first trip to St. Petersburg. "We are both lively and love the arts," he said. "There are a lot of similarities." The same message has been preached by those who helped bring Mirabal here — officials with the city of St. Petersburg, the St. Petersburg Arts Alliance and the St. Petersburg Downtown Partnership. They want regular art exchanges between their city and the island nation. "Art is certainly something St. Petersburg and the culture of Cuba have in common," said Joni James, chief executive officer of the St. Petersburg Downtown Partnership. "Art is a universal language, particularly between two cultures that sit just across a small spit of water." In October 2015, a delegation of St. Petersburg arts leaders traveled to Havana. In December, the city welcomed a high-ranking official from Cuba's Ministry of Culture. The exchange led to an exhibit by Cuban artist Esteban Machado this year at the Morean Arts Center. Future collaborations also were discussed between Cuba and the Warehouse Arts District, which covers about 1.5 square miles and consists of more than 20 arts spaces — galleries, studios and warehouses. Mirabal's project is the first from the collaboration, and it follows the creation of 21 murals during St. Petersburg's SHINE Mural Festival. Mirabal's My New Friend, now hanging in the U.S. Embassy, is a joining of Cuban and American flags made of colored handprints. He is considered one of Cuba's most popular artists, James said. "By any standard, he is an incredible artist," she said. Now, Mirabal hopes St. Petersburg artists will display their works in his Havana gallery. "I want this to be a good relationship. This can be good for everyone." Contact Paul Guzzo at pguzzo@tampabay.com or (813) 226-3394. Follow @PGuzzoTimes. The colors are the same and bleed into each other on purpose. Mirabal stood before a 50-foot long mural blending the American and Cuban flags. Painting such works are his specialty and his latest piece is now on the wall of St. Petersburg’s Warehouse Arts District Arts Xchange building. “We are two countries that we have a lot of things to give each other,” he said. Mirabal, who is from Habana, Cuba, painted a similar piece that hangs in the U.S. Embassy in his hometown. It served as the backdrop for official meetings between the United States and Cuba when President Barack Obama visited the country in March. “Everybody came to take the photos with my painting,” he said with a smile. Paul Glass, the owner of the Warehouse District building that is home to Mirabal’s new mural, stood in silence, puffing on a cigar, watching the artist work. The painting is something Mirabal hopes is an example of peace between the two nations. The painting can be seen along the Pinellas Trail in downtown St. Petersburg. It is the 21st painting painted there by international, national and local artists this month, coming on the heels of the Arts Alliance’s annual SHINE Festival. ST. PETERSBURG (FOX 13) - St. Petersburg is continuing its push to be the first U.S. city with a Cuban consulate. City leaders are showcasing the art work of a famous Cuban artist in an effort to warm up to the nation’s government. Michel Mirabal is known internationally; his work being featured by U.S. Secretary of State, John Kerry. Mirabal usually uses flags as a centerpiece for his work. He is working on a mural in St. Pete’s warehouse art district, which will be completed Friday, and features a coming together of the American and Cuban flags. “This community has a good relationship between my countries – Cuba,” Mirabal said. City leaders in St. Petersburg have been working for more than a year on their campaign to be Cuba’s choice for a consulate. Mayor Rick Kriseman has visited the country twice. Joni James, CEO of the St. Petersburg Downtown Partnership says art exports from Cuba would be one benefit a consulate would bring. Mirabal’s mural will be unveiled Friday at Art Xchange’s Soft Water Studios. When craving a candy box of sensory pleasures, it's hard to beat St. Pete. You can laze on sugary-sand gulf beaches lapped by emerald waves, then catch a trolley to a cornucopia of world-class art, shopping and gustatory delights edging Tampa Bay. Famously sunny St. Petersburg has evolved from a Florida retirement haven to cool-culture constellation. Glass studios, brewpubs, gourmet ice pop shops, smart museums and eye-stopping murals swirl in this orbit. The old pier's gone, but there are more places than ever to watch rolling clouds and spectacular sunsets. Skip the driving; get a $5 trolley day-pass and dive into a sampler of eye candy. St. Pete is earning kudos as one of America's best art cities and a world leader in glass. More wonderland than gallery, the Chihuly Collection whisks you into imaginary worlds created by glass master Dale Chihuly and his team. Frequent docent tours reveal ingenious techniques and secrets about each tantalizing sculpture. The collection relocates this fall from bayfront to the Morean Arts Center's block, adding to the explosive energy coursing through St. Pete's Central Arts District. The Morean, which began as a local art club in 1917, displays glass works pretty and provocative. Its backyard Glass Studio offers fascinating daily glassmaking demos and giftable pieces for sale. Just west of downtown, the Warehouse Art District is now home to about 200 glass artists. One, Duncan McClellan, has transformed a tomato packing plant into indoor-outdoor glassmaking and gallery spaces. Also in the Warehouse district, the Morean Center for Clay has repurposed a train station by the 47-mile Pinellas Trail, one of America's first rails-to-trails projects that's now beloved by walkers, joggers and cyclists. Towering kilns dot the grounds like mysterious relics. The bohemian Grand Central neighborhood is home to ARTpool (nostalgic vintage), mod clothes boutiques and new Cage Brewing, decorated with a mad-cap cat mural. The Edge boasts attractions from Furnish Me Vintage's four stories of fab to award-winning Green Bench Brewing Co., where you can play lawn games and watch movies in the garden while sipping brews crafted with local ingredients from neighboring coffee roasters to rooftop beekeepers. Bayside, there's plenty to refresh the senses: weekend festivals, St. Petersburg Museum of History's "Happy Hour with the Historian," the Museum of Fine Arts' performance-art coffee klatches and bayfront weekend markets. Central Arts District hotspots include Florida CraftArt, which showcases wonderfully unique handmades by local talents and serves as the meeting point for new Saturday morning walking tours that highlight street murals by resident and international artists. Peruse enchanting finds at The Swag, newly opened by vintage fanatics, then wheel into neon-lit Cycle Brewing for stealth releases. Just south, the Dali Museum gleams by water's edge. Tips: Grab one of the free newly designed audio-visual guides for backstories about the visionary artist and his times, relax in the cool Avant Garden -- and catch the new multi-media "Disney & Dali: Architects of the Imagination" show about these geniuses' surprising alliance. Put on an Oculus Rift headset for a virtual reality tour of a Dali masterwork. This milestone in museum technology is a trippy journey past spindle-legged elephants, the lobster telephone and a chromo-hologram of Alice Cooper. Other downtown venues slated to open in the next year include a huge American Arts and Crafts museum and Western art showcase. Cayenne watermelon, bourbon peach, ginger plum, cilantro....it's hard to choose among the 35 handcrafted varieties at Hyppo Gourmet Ice Pops. The rainbow-colored treats are flavored by fresh fruits, herbs and spices. Nearby, Cider Press Cafe serves artful and addicting raw vegan compositions in a high-design dining room of bamboo and polished concrete. Both opened this fall in the Central Arts District. A few blocks away, exotic aromas waft from Meze 119's colorful plates, Il Ritorno packs in farm-to-table connoisseurs for popular tasting dinners, and the Canopy Rooftop Lounge pairs zesty, pretty flatbreads with breathtaking bay views. Beachside at the Hotel Zamora, Castile Restaurant chefs arrange locally sourced ingredients into delicious collages. Beach bars crank up the live music before the fireball sun dips through striped skies into the Gulf of Mexico. Festive, friendly favorites include Caddy's (libations allowed on the sand), Jimmy B's (bandstand, volleyball, free sunset shooters) and Hotel Zamora's new 360Â° Rooftop. For gorgeous views by the bay, tour the spectacular Vinoy Renaissance Resort. Since first opening Christmas Eve 1925, the classic pink-palace hotel hosted celebrities and titans, served as a military training site during WWII, spun into decay and hit bottom as a low-rent boarding house, then was rescued and restored to its former glory starting in the 1990s, beautified further in recent years. After dazzling your eyes, stretch out on St. Pete's sugar-sand beach and give them a rest. Improvements are in the works for the Warehouse Arts District. Close to 100 people at the Warehouse Arts District association's annual membership meeting heard about streetscaping, lighting the Pinellas Trail and 30 new studios for artists. Mary Jane Park, executive director, said the organization is halfway to its goal of raising $800,000 thanks to a state grant for $300,000 and $100,000 from the city of St. Petersburg. The money will help pay for renovating a 15,000-square-foot space inside an existing warehouse for 20 to 30 artist studios. More than 300 artists, 10 percent from outside the state, have signed up for space in the Warehouse Arts District. Park said fundraising is ongoing and construction on the first phase of studios could start pretty soon. Meanwhile, the city's economic development department is seeking approval for streetscaping, new lighting, and landscaping along the intersection of 22nd Street and Fifth Avenue S, where the arts district sits. Mark Aeling, a local sculptor and president of the ArtsXchange, has been a pioneering force in the St. Petersburg arts community, but his experience and expertise has extended both throughout and beyond the Tampa Bay area. 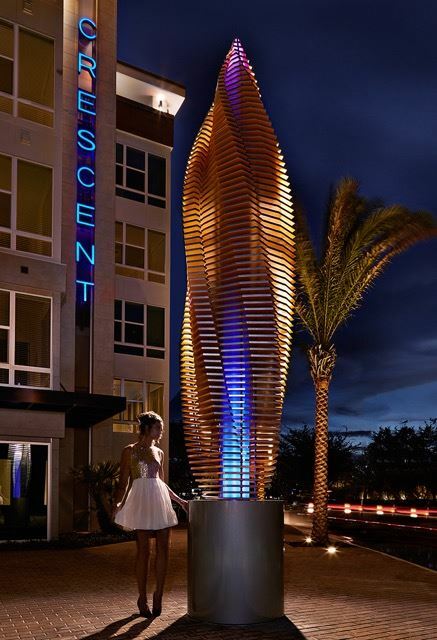 Recent studio projects include “Budding Vortex” at The Crescent Westshore, “Ripples of Life” at The Florida Aquarium in Tampa and “Vertical Hum” for Metro Development in Rocky Point — Aeling and his team created the 20-foot abstract metal sculpture with a movement created to represent the wind on water. Aeling took some time from his busy schedule to answer some questions for Alive Tampa Bay. Would you tell us about a couple of firsts — when you first knew you wanted to become a sculptor and your first high-profile large-scale work? I had sculptural aspirations at a very young age. I had my first experience of bliss at the age of 7 making a little playground out of clay. It was the first time that I had an “out of body” like experience and felt connected to something greater than myself. The first high-profile project I did was for the Seattle Opera when I was about 23 years old. I made a couple of pieces of sculptural scenery that were the focus of the production. My first large sculpture commission for MGA was a guilted eagle for a bank in St. Louis. It had a 14-foot wingspan and sat on top of the building. That was back in 1996. What were some of the challenges involved with opening up the MGA studio? You could say I began the foundation for MGA when I was in seventh grade and asked for a jigsaw, a drill, and some clamps for christmas. I got my first business license for MGA Sculpture Studio in 1996. I built it one job at a time, reinvesting a percentage of my profits back into the company to by equipment. I never took a business loan. I was given the gift of drive and vision at a very young age. I love the experience of creating; it is my religion, and my studio is a shrine. One of the greatest challenges I faced was keeping the doors open through the recession. 2010 was a tough year but 2015 is my best to date. 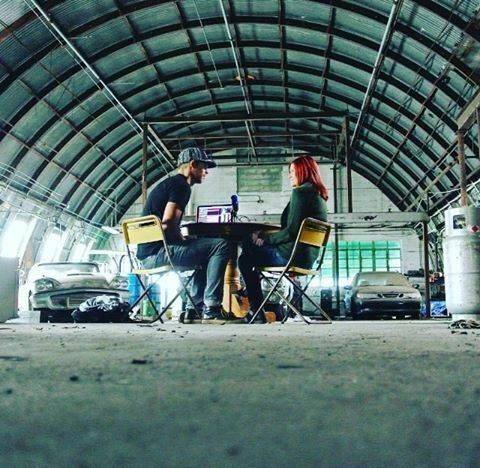 Please tell us how you got involved with the Warehouse Arts District’s ArtsXchange and how things are coming along with the facility? I have had my studio in the same location in St. Pete for over 11 years now. Long before it was known as the Warehouse Arts District. As the arts community developed we recognized a need for an entity that would help individual artists expand their marketing potential and also create an entity that could interface with the municipality on their behalf. An individual artist’s voice is small but as a group we can be heard. As the success of the district grew it became clear that the same problem would evolve here as in many other areas throughout the country. Artists move into run down parts of town for big spaces with cheap rent. Their creative energy attracts attention. That attention brings with it development. That development drives up prices which drives out artists. I got involved because I wanted security and taking an active leadership role was a way to make that happen. The ArtsXchange continues to move forward. At times it is a slow and plodding course but we have some very good people behind the project and there is truth in the mission. We have had a couple of minor setbacks working with the current construction climate in St. Pete. The success of our city in the past year or two, while wonderful, can create some challenges with costs and planning. We have had to make some adjustments in strategy but are now in a good position. Plan on seeing major progress on the ArtsXchange project as well as the Warehouse Arts District as a whole in the next year. You don’t appear to be as flashy as some other artists. You use the word “we” on your website. You help other artists and talk about your studio as “a team player.” Do you intentionally like to keep things low-key and collaborative? I once heard it said that it is best to be confident in your abilities and humble in your actions, a motto I try to live by. Large-scale sculpture is very labor intensive. I take full responsibility for everything my team creates and I guide the hands that help me but it is often a team effort and those that help feel more connected to the project if it is considered a “we” and not an “I” endeavor. From Aurora, Colorado, to college in St. Louis — Florida is such quite a change of pace. What drew you here? I was dissolving a business relationship in St. Louis and relocating my studio. I had located there after graduate school because the work was good but I had no binding connection. I was doing an installation on the east coast and took the opportunity to drive south and check out cities for a couple of weeks. I stumbled into Saint Pete and fell in love with the city. Don’t get me wrong I miss the mountains and the dry air very much but the beach is a good surrogate. Aeling’s studio and current projects can be seen during Second Saturday Art Walk (every second Saturday of the month) MGA Sculpture Studio, LLC, 515 22nd St. S., Unit E, St. Petersburg; (727) 327-3473, mgasculpture.com. The Warehouse Arts District has blossomed into one of the most creative neighborhoods in all of St Petersburg. An eclectic group of painters, glassblowers, sculptors & visual artists have fused together to act as a collective voice for the area ensuring stability & success towards future growth. Learn more about this golden nugget from Tracy Kennard, one of the founding members of the Warehouse Arts District Association, about what started this movement, the exciting ArtsXchange project, and what the future for this area has on tap!